The game presented here is a running game, with a side camera as in Canabalt. It is designed for Facebook and mobile devices. Every level has an end that the player needs to reach to complete it. 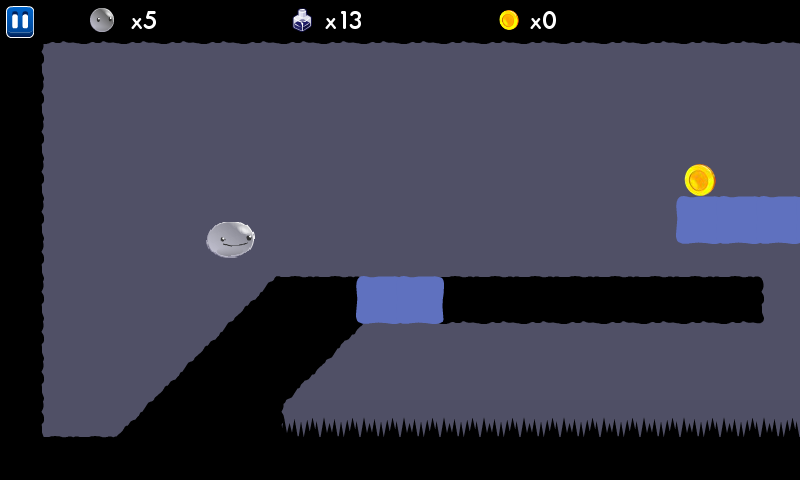 But levels are not complete, and they have holes preventing the player from his goal. There is a limited quantity of ink, not limited to a single level, in order to build new platforms to jump on them. Of course, if the player falls out of the screen or on enemies, he loses a life. So the player has a choice: he can either use a lot of ink to build platforms and make the current level easier to pass – but he won’t have much ink left to play other levels – or he can use less ink, taking more risks. This way, the player can set up his own challenges. When the player loses a life, he also has the possibility to add more ink to the level and make it easier each time, at the cost of ink. Lives and ink are the main components for the economic model on this concept. They both can be bought on the market or asked to friends. There are also coins in the game that can be acquired on the level. They will be used to buy small boosts for the player and tu guide him on where to put ink on the level building phase. 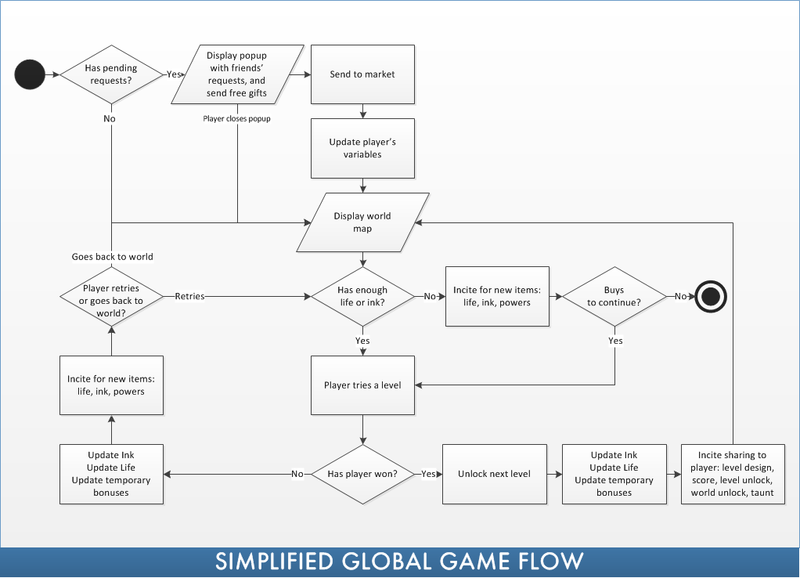 Following are two graphics: the left one presents the global gameflow of the game, with some social and economic features. 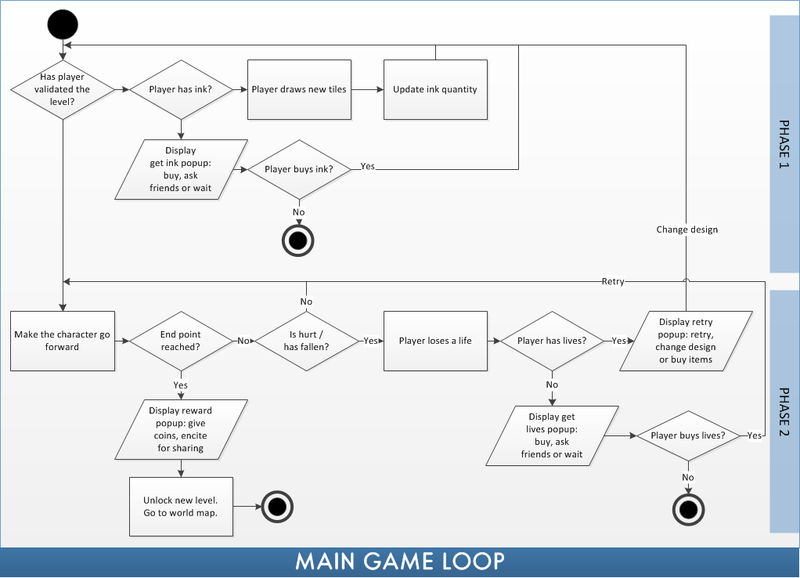 The right one presents the main game loop, where the player has to design the level in phase 1, and phase 2 represents the playing part. The game is divided in two phases. In the first phase, the player designs the level. He can see is lives and the remaining ink, the total amount of coins he has. He can touch the screen/click to add new tiles if he has enough ink. Another touch/click will remove the manually entered tile. Swiping will scroll the level, so will clicking on left/right buttons. 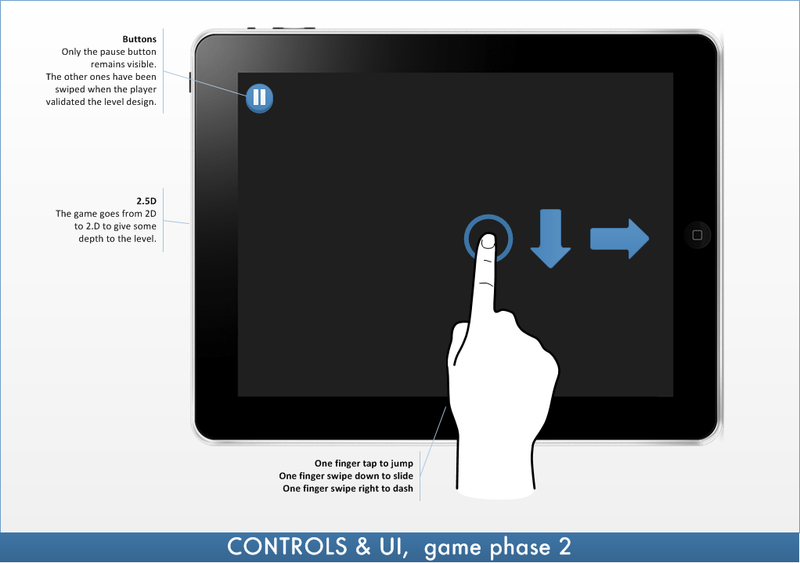 A button “Let’s play!” launches the phase 2, the phase where the player actually plays the level. In phase 2, the “Let’s play!” button and the left/right buttons disappear. The avatar will go forward automatically. All the player has to do is to tap/press the spacebar to jump. Of course, other actions can be added further in the game like sliding or dashing to destroy specific tiles. 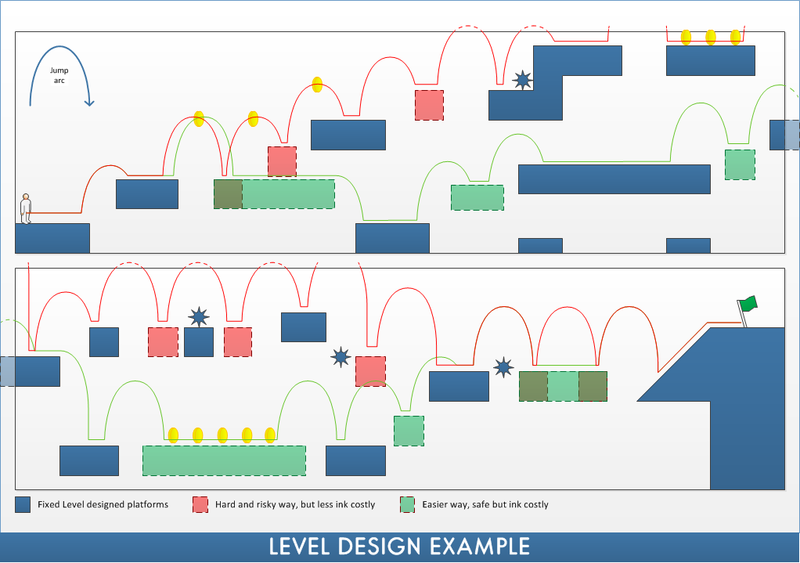 If the player loses a life by hitting an enemy or by falling out of the screen, he is then given the choice to modify the level design he created – at the cost of more ink. He can also just try his level again. When he has no more lives, he can buy new ones or ask friends to send him some. The same goes for ink. Ink and lives will replete progressively over time. 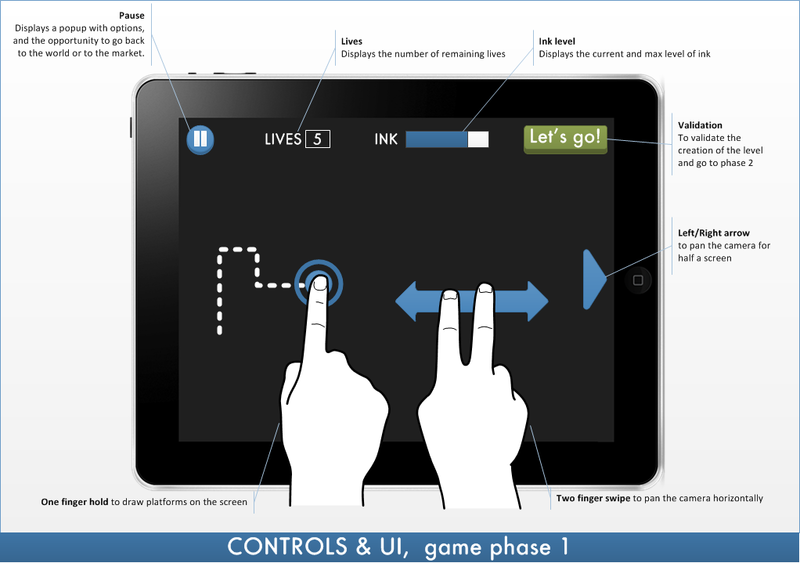 First levels are used to introduce the game and new features progressively. Each time a new feature/game mode/game brick is introduced in a level, an explanation on how to use it/conquer it will be given to the player. Coins are used as an hint on where to place new tiles and are very rewarding on the first levels of the game. Later on, they will be used to entice the player to take greater risks or to use more ink. The game world contains all levels. It is divided in multiple sub-worlds, that will have their own universe. Each sub world introduces at least a new feature/game mode/obstacle. Like in Candy Crush Saga, unlocking a new world requires the help of Facebook friends. Without a Facebook account, the player will have to pay with real money or to use a lot of coins to pass. This place will also be used as a social hub, where players can share their progress and pictures of their levels once the player has passed them. 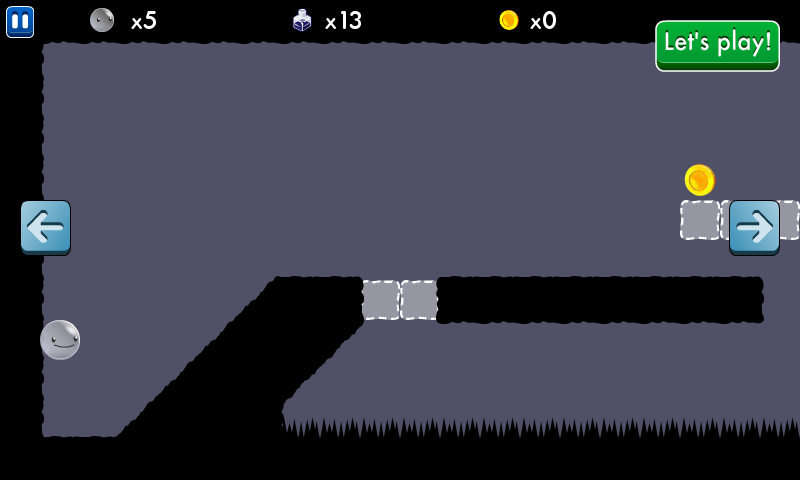 Next is an example of a level design, with two possible paths and tiles for the player. Although this page is posted in concept, there is indeed a small prototype for the gameplay. It’s pretty simple since the main interest of this concept is focused on the economic model and on the social features.